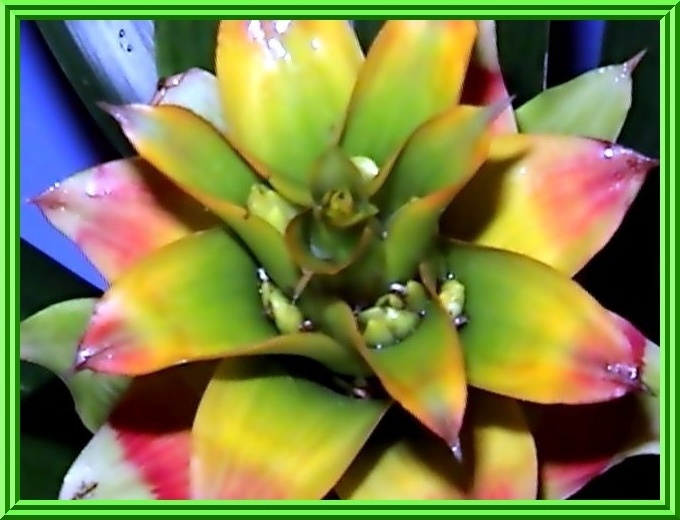 This Bromeliad was named for the 18th century Spanish Naturalist... Anastssio Guzman. There are about 150 species in this family and hundreds of hybrids nearly all tank-forming. Guzmanias are probably the number one interior houseplant. Guzmania... Tillandsia and Vriesea are similar in many ways. One of the main differences is that the Tillandsias and Vrieseas have what is called 'disticaous' flowers (flowers arranged in two rows). On the other hand... Guzmania's flower spikes are always 'polystichous' (spikes radiate from all sides of the axis). This family is found mainly in Columbia and Ecuador. Guzmanias can adapt to darker conditions than other bromeliads. Many will do well at 1000 to 2000 footcandles of light. For this reason, they do especially well in the low light of most homes. Many guzmanias do not tolerate extreme summer heat, especially hot sultry nights, but some others do. Nightime temperatures of 60 to 68 degrees F. are ideal for most species of guzmanias. Water quality is very important for guzmanias. They are extemely intolerant of hard, alkaline or salty water. Flush the water in the central cup of the plant with bottled or rain water frequently and the plants should do well. The potting medium must be acidic. A 1:1 mix of coarse peat moss and fir bark produces great results. The addition of some dolomite lime to provide needed calcium and magnesium is also recommended, only a little... its alkaline. Use an acidic fertlizer without boron, zinc, or copper micronutrients. Add slow release fertilizer to the potting medium and use liquid fertilizer only if very dilute. Guzmania's grow anywhere from sea level to 10,000 feet... but thrive in warm, humid temperatures. Indirect sunlight and good air movement make a perfect environment. The inflorescense is usually the main attraction here... although some Guzmania's have very attractive foliage... like the "Sanguinea" pictured above. The bright Red... Orange and Yellow leaves appear only at flowering times and can be quite varible. Other foliage colors can in fact include some coloring however, as a general rule... most are green. They are also thornless. The sizes range from small (six to thirity inches in height), to over three feet in width. 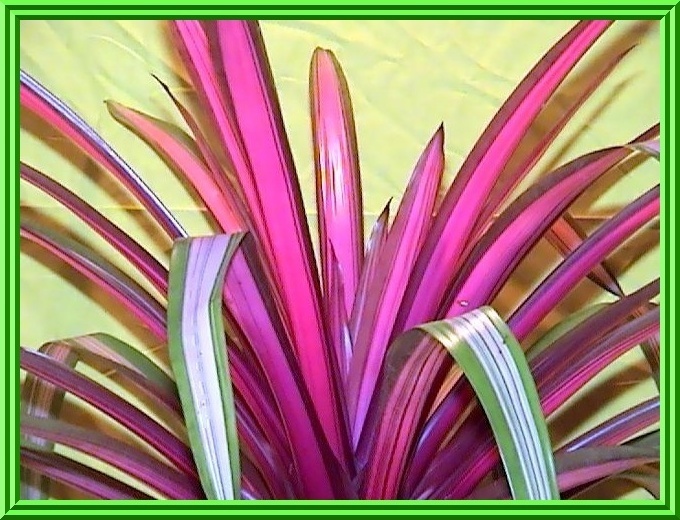 Most of the Guzmania's are in the medium range (sixteen to eighteen inches in height). The flowers will last from thirity to ninety days on the average, and make excellent indoor houseplants. Guzmanias are not as numerous as tillandsias or vrieseas... to which they are closely related. They belong to the subfamily Tillandsioideae and they have entirely spineless leaves. Most of them grow in moist... cool and shady habitats in the lower part of the jungle where they are found growing on trees and bushes, though larger species grow as terrestrials and in leaf mold. Most of the propagation is done through tissue culture in Europe... Belgium, Germany and the Netherlands, from where they are sent to the United States and other countries to be grown for the houseplant trade. There is a wide variety of shapes in the inflorescense (flowers, sepals, primary bracts, flower bracts), from a straight spear-like structure, to a globular one and spreads out to a large head. One exception is Guzmania sanguinea... of which there are two varieties, a large form and a small one. 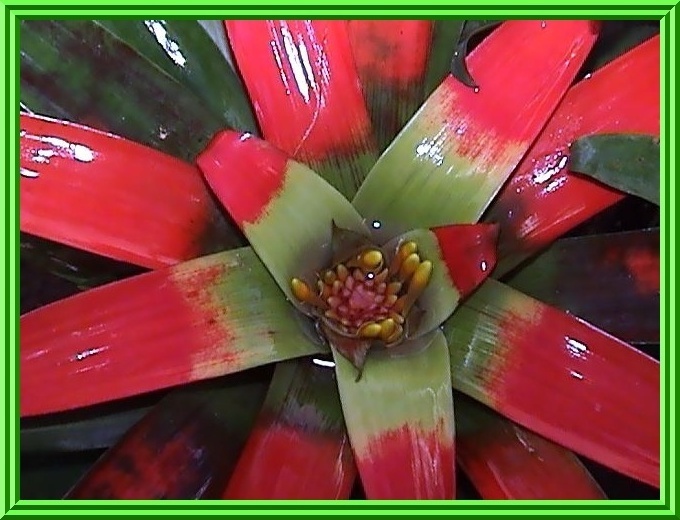 This bromeliad has flowers that come up from the center of the cup where the leaves have turned bright red and/or yellow, and having an appearance more like a Neoregelia than a Guzmania. They are not prolific puppers, producing one or two at most... which grow right at the top of the plant and are very difficult to remove. They are best left on the parent plant as long as possible because to get at them requires stripping the leaves and almost destroying the plant. Currently there are 183 species of Guzmania, but only a few are readily available commercially.